The International Centenary Gathering was held at Adyar on January 2nd & 3rd, 2008. 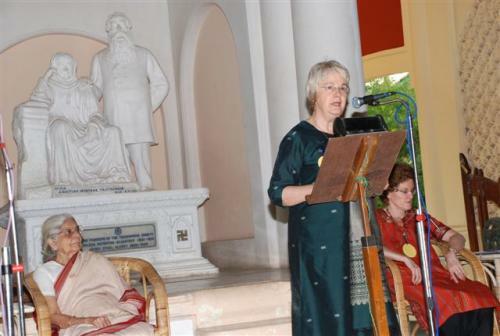 Mrs. Radha Burnier, the International President, addressed the gathering. Mrs. Diana Dunningham Chapotin gave a report of the activities of the TOS across the globe. Mr.B.L.Bhattacharya added a word of welcome, on behalf of the Indian TOS, while Mr.P.S.Mital gave a brief report of the activities of the TOS in India. Greetings were received from many parts of India and the world. A tribute to Dr. Annie Besant was delivered by Ms. Dorothy Bell. The TOS in Chennai presented a DLP projector to the headquarters of The Theosophical Society. It was funded by Mr. N.C.Raghava in memory of his grandfather, Mr. M. Krishnamacharyulu, a very devoted Theosophist. The morning session concluded with a symposium with speakers drawn from key TOS workers across the globe. The group photograph which followed this session is shown here. The film ‘Horizon of Hope’ which covers the relief and rehabilitation activities of the TOS, Chennai was screened on the 2nd afternoon. Copies of Mr.Vicente Hao Chin’s presentation on Root Causes and Symptoms were distributed to various representatives of the TOS. On the morning of 3rd January the delegates to the gathering visited the Besant Theosophical High School & the Olcott Memorial High School. DLP projectors were gifted to both schools by the TOS-Chennai, in order to form the core of digital libraries in these schools. Dr. Mohamed Rela’s family contributed the entire sum required for the purchase of these projectors. Delegates participated in a special celebratory lunch on 3rd afternoon. Dr. John Algeo gifted two wheel-chairs on behalf of the TOS, for the use of physically challenged persons. The concluding session of the gathering was a public function held by the TOS, Chennai Region. Excerpts were read from Sir Edwin Arnold’s ‘Light of Asia’, Mr.W.Q.Judge’s pamphlet on the life of Mme H.P.Blavatsky and Dr.Annie Besant’s The Theosophic Life’ The Chief Electoral Officer of the State, Mrs. Naresh Gupta was the Chief Guest. The speakers included Mr. Naresh Gupta, Mrs.Radha Burnier, Mrs.Diana Dunningham Chapotin and Mr.C.V.K.Maithreya, who presided over the function. 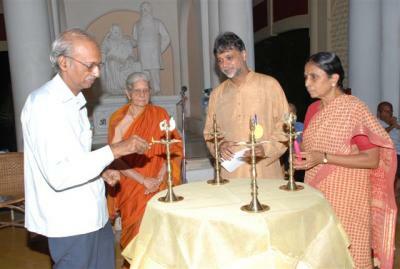 Lamps were lit by the speakers, representative of the different faiths and on behalf of the Government, the Press, NGOs, Industry and also office-bearers of the T.S. and the T.O.S. The function concluded with a chant for peace by Mrs.Manju Sundaram, followed by a few moments of silence. Preceding the International Gathering a free medical camp was held by the TOS, Chennai at the Social Welfare Centre. A ‘jumble sale’ was simultaneously held by TOS volunteers along with members of the International Order of the Round Table; this was for the benefit of the underprivileged and it also served to raise funds for the activities of both organisations.